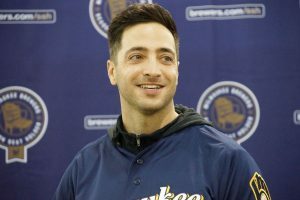 MLB Star Ryan Braun made an appearance and spoke at the University of Miami last month on February 10. Braun and attendees gathered at the Watsco Center Fieldhouse on campus for the introduction of the 2017 UM baseball team which was followed by dinner and his talk shortly after. The pro baseball player attended the University of Miami, so it was great for him to be able to return home to his stomping grounds and interact with the current student body and fans. Tickets to get in were $85 per person and even had tables for eight at $680, but the room was full pretty quickly. It was a very exciting event and will be one that is memorable for decades. The Los Angeles, CA native started playing tee-ball at the young age of four and was eventually introduced to baseball, basketball, and soccer. However, by the time he got into high school, he decided to focus just on baseball and found that he really excelled at the sport enough to pursue it as a career. After getting into the University of Miami on an academic scholarship he continued to play the sport and was eventually drafted by the Milwaukee Brewers in 2005 in the first round as the fifth overall pick. Braun is still on the roster of the Brewers going on his tenth season now, and in addition to that, he has also accomplished being a six-time All-Star player and a five-time Silver Slugger Award winner. Brewer traveled back to his former university to speak at the introduction of the 2017 UM baseball team and dinner during the first half of last month. It was a fantastic time for everyone who went, and the audience was able to connect with one of their own former “hurricanes” in a new way. If your company is interested in finding out availability and booking fees for a professional baseball player like Ryan Braun or other sports celebrities for a Keynote Speech, Personal Appearance, Charity Event, or Baseball Camp, call us at 1-888-246-7141.